I have had some highly successful photography trips recently, photographing some of nature’s beautiful and fascinating wildlife, but have not shared much of it on my blog. In fact, it has been about a month since I posted an article. During the month of April, I have been to Chincoteague National Wildlife Refuge (NWR), Blackwater NWR, Huntley Meadows Park, and on Lake Montclair. At those locations, I saw and photographed various song birds, shorebirds, wading birds, and eagles, hawks, owls, wood ducks, wild horses, and elk, and I am planning to share some of those images over the next couple of weeks on my blog. However, the most exciting photography event happened last weekend at Huntley Meadows Park in Alexandria, Virginia, when I was in the right place at the right time. 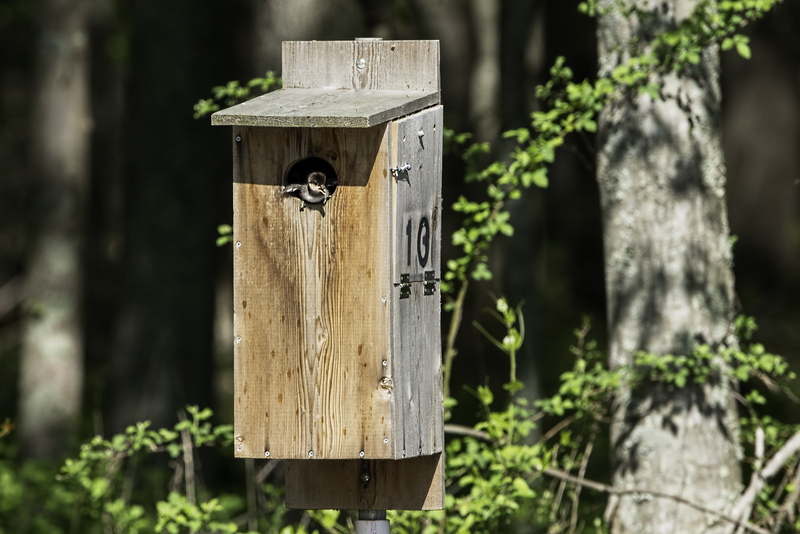 I was there primarily to photograph Wood Ducks and found a pair casually feeding in a beaver pond and, while photographing them, a hen Hooded Merganser appeared at the opening of a nesting box in the beaver pond. What was odd was that she maintained a position (below image) of half in and half out of the box, while obviously looking around the area for about 15 minutes. During that time, I said to a friend, Ernie Sears, who also was photographing the Wood Ducks, “wouldn’t it be incredible if we happen to be here when her ducklings emerge from the nesting box.” At the time, I did not notice the egg shell attached to her chest (below image). On a previous visit to Huntley Meadows, a park volunteer said that last year a photographer spent an entire week, everyday at the same location, in order to photograph the ducklings as they dropped from the nesting box. I never thought we would be so lucky. 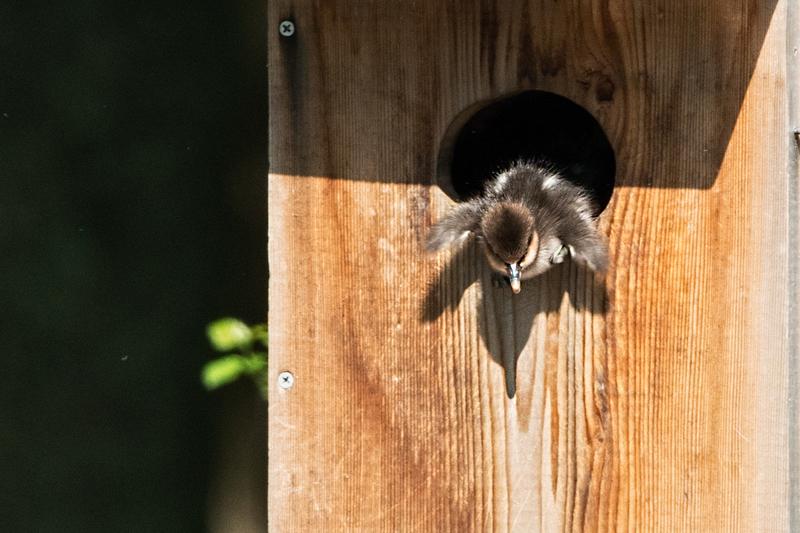 Shortly after my comment to Ernie, the hen Hooded Merganser flew down to the water, and then a duckling appeared at the nesting box opening (below image). I could not believe my eyes. Our timing was incredible! 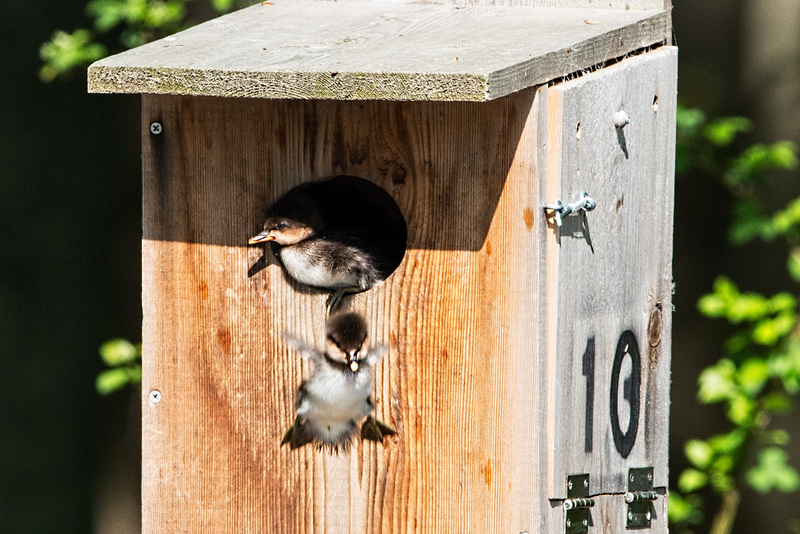 Within a few seconds, the duckling saw its mother on the water below and jumped out of the box. Then, another duckling appeared at the opening and did the same. At times, there were two ducklings peering out and then leaping to the pond about 5 feet below. Below are some of the images I captured as they appeared in the opening and jumped to the pond. It was an incredible and exciting sight. On several occasions, it looked like the last duckling had appeared and jumped to the pond, but within a short period of time, another appeared and then another. This happened over and over again. 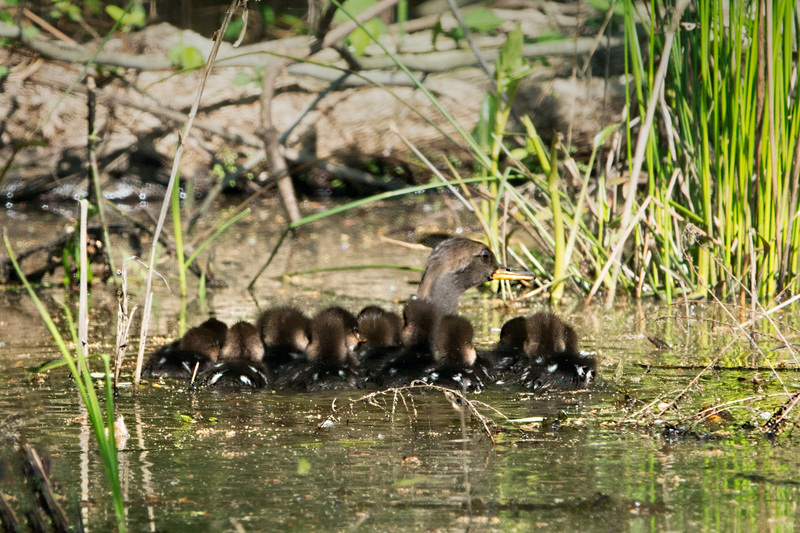 In total there were 16 ducklings that jumped from the nesting box to the pond below. As you can see from the above images, their descent was far from graceful, and they certainly were not flying. Some landed head first, others webbed-feet first, and others belly-flopped. 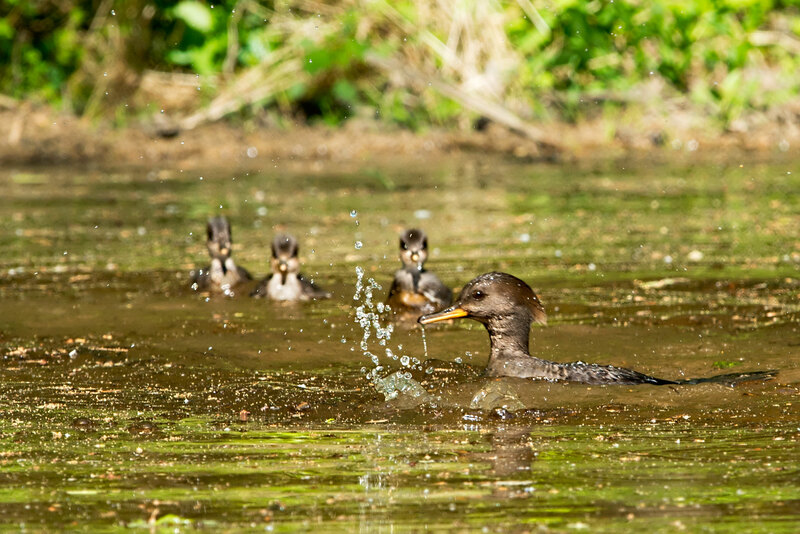 In the pond, the hen merganser waited for the ducklings to splash down, and then she quickly paddled to each of them and led them to the group, which was growing larger and larger. She had to react quickly, because whatever direction the ducklings landed in was the direction they start to swim. It was important that she gather them up quickly and keep them together. The small ducklings were defenseless against any predators, but there is some apparent protection when tightly together. 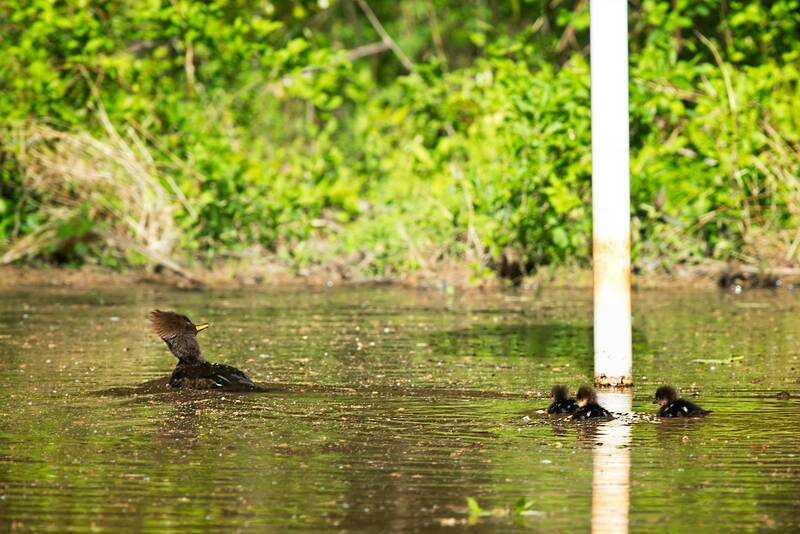 The below images are of the hen merganser swimming around the pole that held up the nesting box as she led the ducklings into the group. 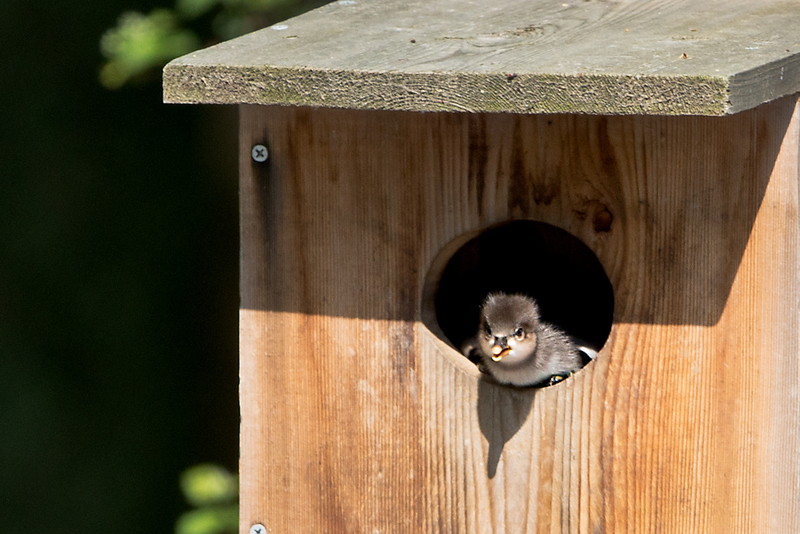 In the below image, the hen merganser can be seen looking up to the nesting box waiting for the next duckling to jump. 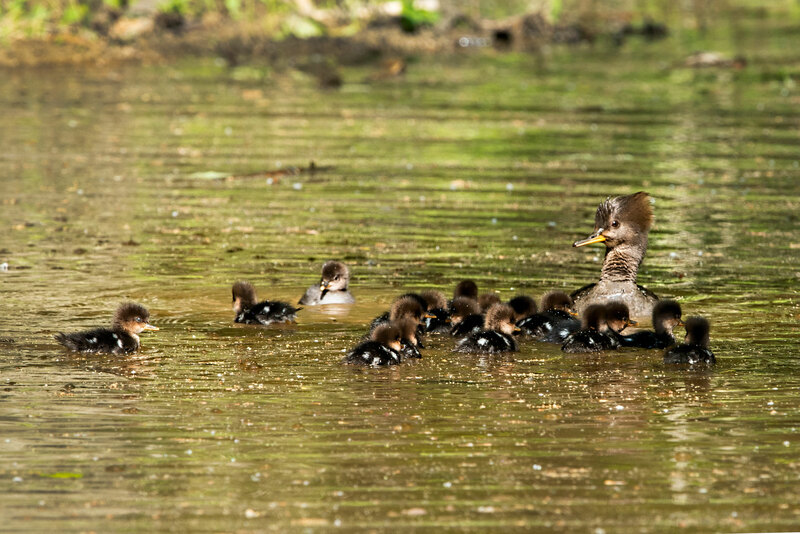 After the last duckling had landed, the hen merganser kept them tightly together and began to swim toward a creek and into the forest. The ducklings were too obvious out in the open to potential predators, such as hawks. 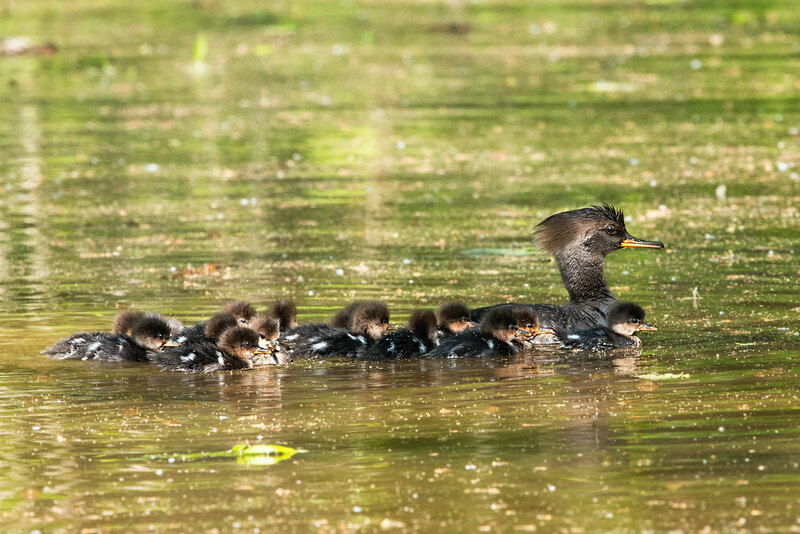 Below are images of the hen merganser and her 16 ducklings as they swam away. 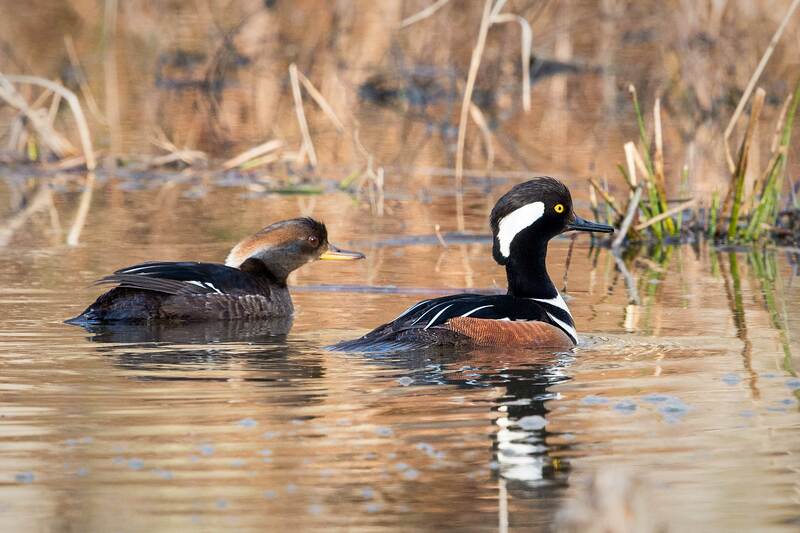 As you can see by the above images, the drake Hooded Merganser was not around, which is typical. When the hen begins sitting on the nest, after laying her eggs over a couple of weeks, the male departs. 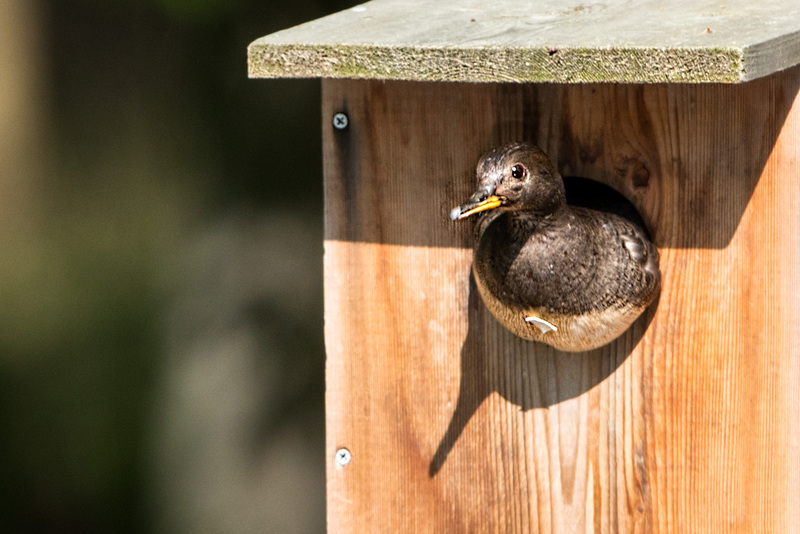 Hooded Mergansers nest in tree cavities (and nest boxes), and can lay up to 13 eggs in a clutch. 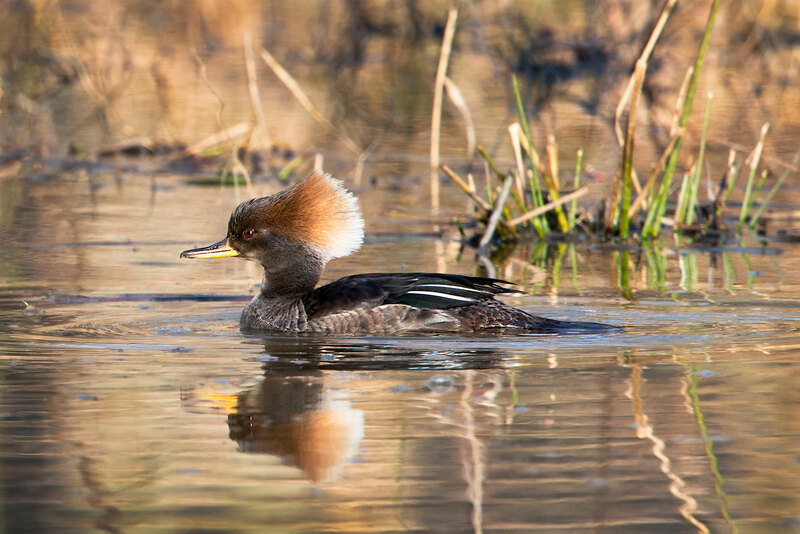 At times, more than one hen merganser will lay eggs in the same nest–this is known as dumping, but only one hen will sit on the eggs until they hatch. 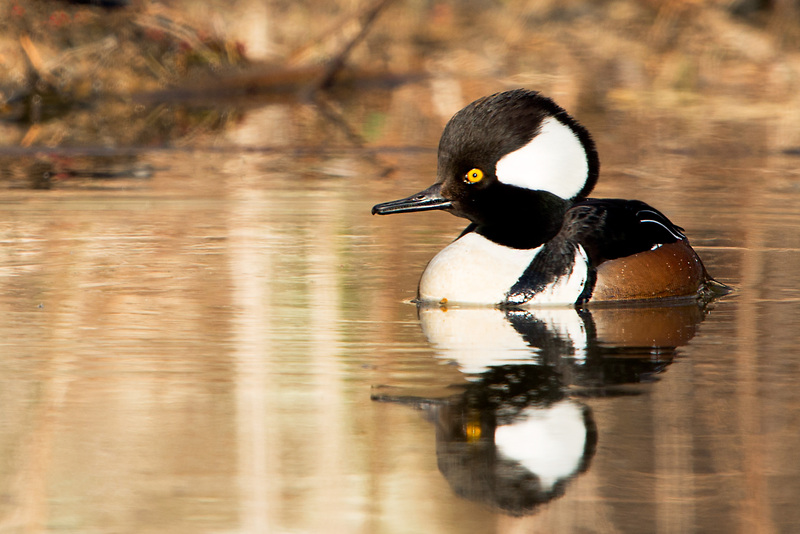 A Hooded Merganser nest was once found with 44 eggs in it. Once the eggs start hatching, they will all hatch in about a 24 hour period, and after they hatch, they all leave the nest at the same time to join the hen either on the ground or water below. 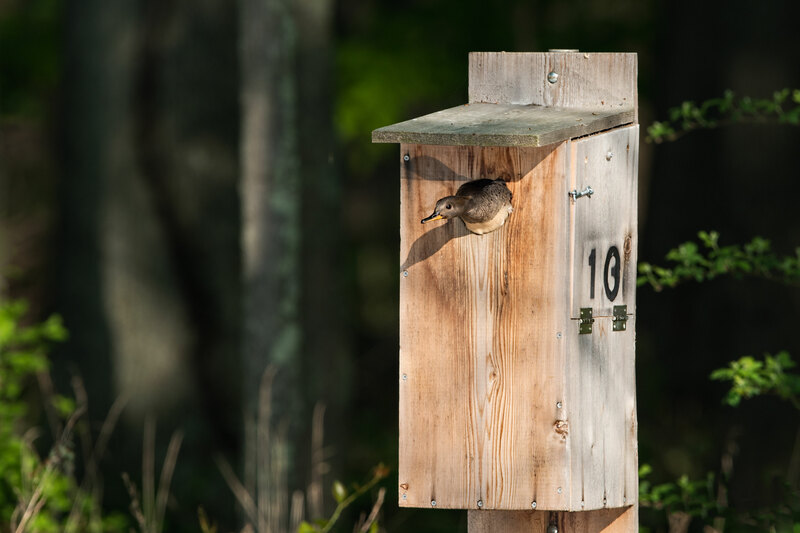 Tree cavity nests range in height from 10 – 50 feet above the ground and can be as high as 90 feet. Somehow, the ducklings survive the fall. 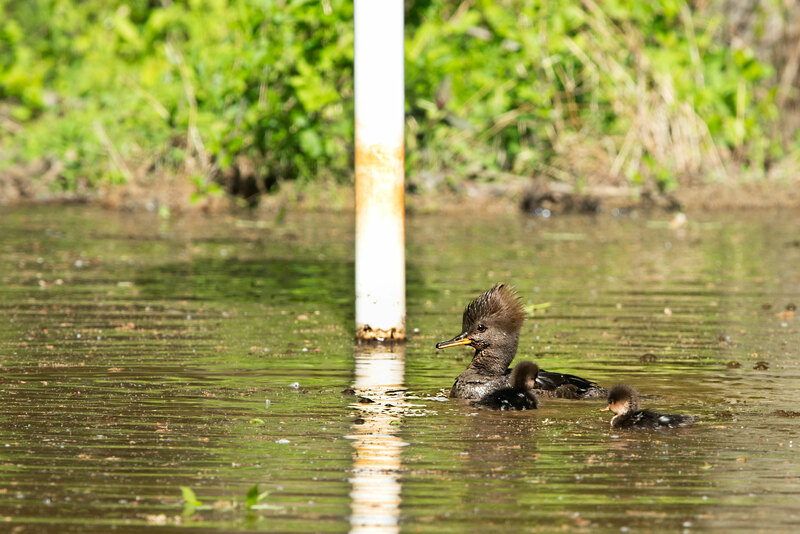 Some merganser nests have been found over a half mile from water, meaning the hen and her ducklings must walk (or waddle) that distance to reach the water. Comparatively, the ducklings that I photographed had it easy. After reading this article, you can see why I titled it, “In the Right Place at the Right Time.” It was most likely a once in a lifetime exciting event to see and photograph. This entry was posted in Bird Photographs, National and State Parks, Nature, Wildlife and tagged Hooded Merganser, Huntley Meados Park. Bookmark the permalink. coming …. Love it all!!! Glad you enjoyed the article and images Marsha. Amazing, Stephen! I enjoyed the photos very much. Congratulations on being there and taking such great photos! Those little duckings are so cute! Thank you Karen–I still cannot believe my timing! What a beautiful story and amazing pictures,i think i was as excited as you..i have waited for long periods for the right moments and when they happen it is a true treat and privilege..my sites are set on Kangaroos that i just miss sparring at the moment..practicing to be big roos or trying to take over a mob…they heard me yesterday and stopped to watch me instead! The airborne duckling in his/her spread eagle descent was such a great shot. I envisioned a small parachute attached. LOL. Thanks for getting back to the blog. I have really missed it. In the right place, at the right time, with a camera! How wonderful for you!! Thanks for capturing and sharing the experience. You’ve done it again! And again, and again, 16 times! 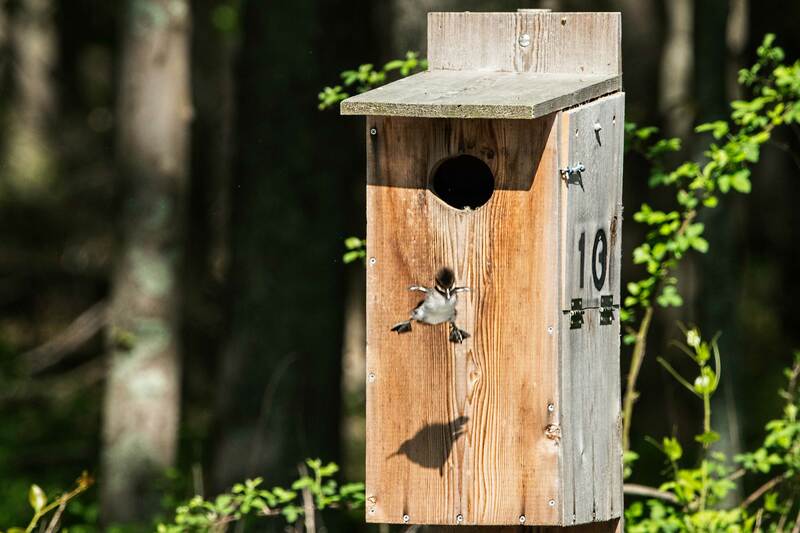 What a blessing you are in taking and sharing these incredible photos, capturing new life emerging from that waiting nest. I think they were waiting for YOU! Thank you. You truly were at the right place, right time, Steve! Wonderful series of photos and explanations. Those babies look like furry bobbers! How lucky you were to be there to document this occasion. As always, I appreciate that you follow my blog and take the time to comment. I like the little “furry” Mohawk hair (feather) styling. Great Story and Images… I see that I am usually in the wrong place at the wrong time! I to this day still lack a good Wood Duck image. I guess I need to tag along some time! OMG!!!! How absolutely wonderful that you could capture this amazing event! Loved reading about the ducklings first swim and the photos are terrific! What a proud and photogenic mama! What brave 16 ducklings, jumping and jumping into the pond without any fear! How lucky you are to witness all of these and capture such fantastic photos! Thanks for sharing this marvelous nature with a great article of yours, Steve! Great to hear from you Kee and thank you for comment. There is no doubt, it was a very lucky day for me. Thank you for taking the time to comment. It was incredible timing and an exciting experience, and i am enjoying reliving with comments like yours. so cute! the babies..great job!